The Vaporesso Luxe ZV Kit is a all-new limited-edition starter kit for you. It consists of a Vaporesso Luxe ZV Mod and a SKRR-S Sub Ohm Tank. Powered by the advanced OMNI Board 4.0 chip and dual 18650 cells, the kit supports 2.5A quick charging and 200W max output. As for the SKRR-S Tank, it features convenient top filling design with 8ml capacity. It is compatible with QF Meshed Coil, QF Strip Coil, and all GT Coils. Available in silver and rainbow. 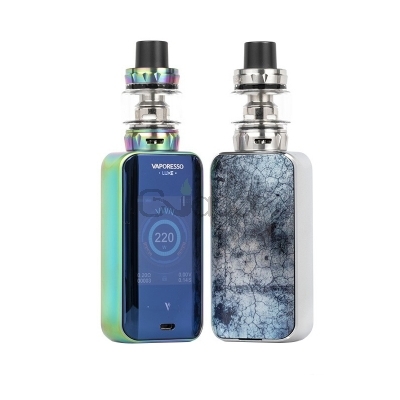 Three Months warranty period for Vaporesso Luxe ZV Vape Kit.